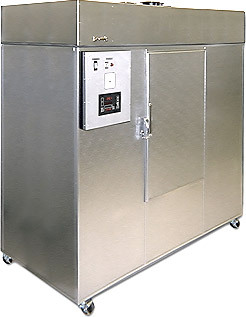 The G series chambers provide an economical solution to environmental control within the basic parameters. They are an excellent choice for teaching plant reproduction, less demanding growth needs, and utility service. The G series design allows a variety of options to tailor a system to your needs. These chambers are normally configured for upward airflow, but can also be supplied with downward airflow. Side-by-side configuration is available to provide independent control of two growing areas in the same cabinet. Two-tiered plant trays and lighting systems can be provided for arabidopsis research. Available with growing areas from 8 ft2 to 15 ft2, a 51" growing height is standard. Standard light irradiance is approximately 500 µmoles (at 36" from lamps), with up to 2,000 µmoles optional. Growing Height 51" 51" 51" 51"
Access Door Size 24" x 38" 2 - 18" x 38" 24" x 38" 30" x 38"
Exterior Dimensions 31" x 66" 31" x 66" 31" x 66" 34" x 90"
Overall Height 72" 72" 72" 72"